Are you looking for the perfect second skin to protect your building from sunlight and the elements while providing an aesthetic, mineral facade? For public buildings, storefronts, apartments or offices, our lightweight Ductal® solution reduces glare and offers less noise than metal alternatives. Our large, thin building envelopes offer the choice between tailor-made precast facades and standardized panels. Our industrialized Ductal® brise soleil is designed to meet the specific needs for a range of building projects. Conceived to let natural sunlight in and then diffuse it upwards instead of directly onto the building, our fiber-reinforced ultra-high performance concrete (UHPC) guarantees that the durability, low-porosity, resilience and ductility of your siding will stand the test of time, while improving the energy efficiency of your building. Ductal® is also a highly moldable material, allowing us to produce customized, precast brise soleil to suit any building's specific location and resist sun intensity. Our brise soleil offer architects a new range of alternatives for lightweight, durable facades with slim, streamlined shapes. Decorative forms that offer your building superior protection? 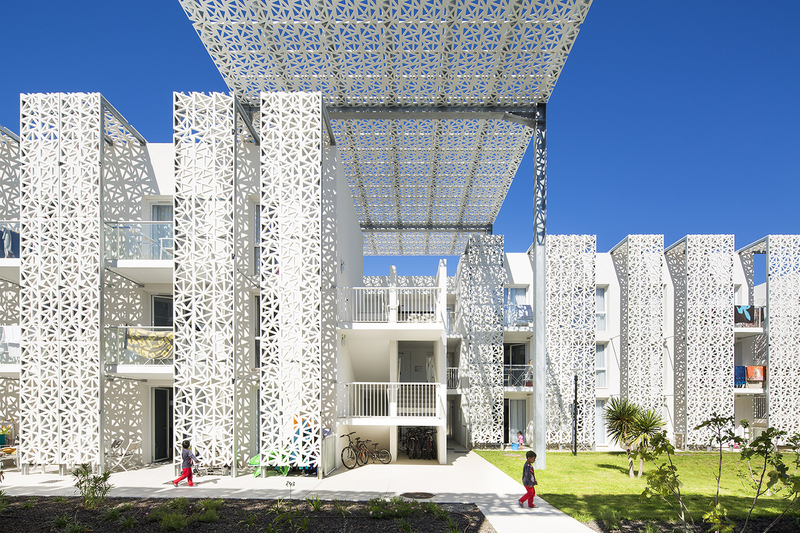 That’s what you get when working with Ductal®’s latticework and perforated facades. From the basic to the most ambitious building projects, our mineral solution offers efficient maintenance properties and exceptional durability. Ductal®’s structural, decorative and protective perforated facades provide innovative, protective solutions in a wide range of textures, finishes and colors. Unlike other concretes, our fiber-reinforced UHPC allow us to produce thin, lightweight panels with large surface areas and perforation rates that can exceed 50%. Ductal® also offers some depth that makes your design play with light and shadows, a characteristic not possible with other steel plate, laser cut solutions, while its high fluidity allows it to be poured into extremely complex and varied forms. With its mineral aspect and a range of color options, you can customize facades to fit naturally into any environment. It’s a light, slim and attractive second skin that can be adapted to almost any use and design. Ductal®’s concrete roofing represents a new technological plateau featuring watertight seals and resistance and optimal mechanical properties to blend slim elements with long spans. With Ductal® architects are open to explore a whole new range of forms. Ductal® custom facades blend creative potential, technology and aesthetics, giving architects free reign to explore near endless architectural possibilities. From tailor-made precast facades to standardized panels, Ductal® offers sleek, durable protection from the elements while providing an aesthetic appearance that provides buildings with high energy efficiency function that produces a real cost savings.